You should already have reviewed Section 2.1, Planning a Data Synchronizer System, filled out the Mobility Pack Installation Summary Sheet, and completed the tasks in Section 2.2, Preparing to Install the Mobility Pack Software. NOTE:If you are setting up a multi-server Synchronizer system, you should have a Summary Sheet for each Synchronizer server. Each Synchronizer server is independent of other Synchronizer servers, so you can set them up in whatever order is convenient given the overall configuration of your Synchronizer system. The following sections step you through the process of installing the Mobility Pack and configuring a Synchronizer server. On Novell Downloads, click Search Patches to display Novell Patch Finder. IMPORTANT:The Mobility Pack software is located in the Patches list, not the Products list. Select Data Synchronizer, then click Search. Under the current release of the Mobility Pack, click the current patch. Click Proceed to Download, then follow the online instructions to download the Mobility Pack ISO to a convenient temporary directory on the Synchronizer server. Continue with Running the Mobility Pack Installation Program. On your Linux desktop, click Computer > YaST, then enter the root password. Under Groups, click Software, then click Add-On Products. On the Installed Add-On Products page, click Add, select Local ISO Image, then click Next. In the Repository Name field, specify a name for the repository that will hold the Mobility Pack software, such as Mobility Pack. In the Path to ISO Image field, specify the full path name of the ISO file from Step 1, then click Next. Under Primary Functions in the Pattern list, select Novell Data Synchronizer Mobility Pack. Click Continue to acknowledge the automatic changes to other aspects of your system that will be made as the Mobility Pack software is installed. IMPORTANT:Do not click Next at this point. After the software has been installed, click Change > Mobility Pack Configuration to configure your Synchronizer system. Use the information that you have gathered on the Mobility Pack Installation Summary Sheet to provide the information that the Mobility Pack Installation program prompts you for, clicking Next to move from page to page. On the Mobility Pack Configuration page, click Next to save the configuration settings and set up your Synchronizer system. You see the Novell Data Synchronizer Mobility Pack listed on the Installed Add-on Products page. Click OK to return to the main YaST page. 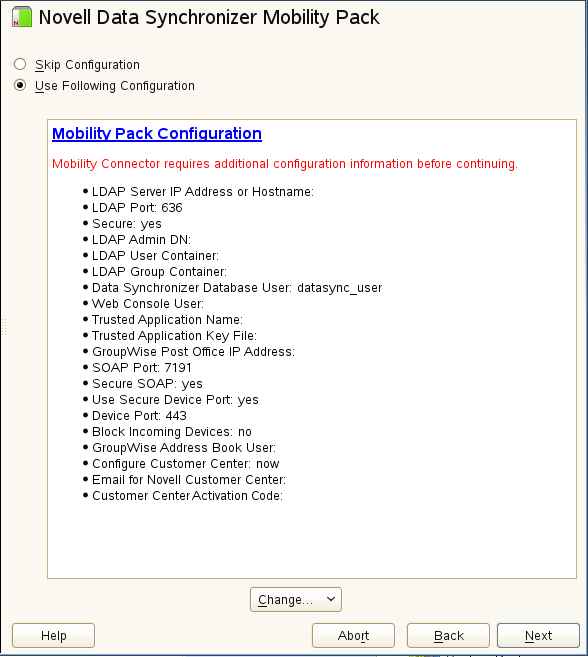 For additional assistance, see Section A.0, Mobility Pack Installation Troubleshooting. IMPORTANT:Although you use the YaST Add-On Products installer to install the Mobility Pack, you must use the uninstall.sh script to uninstall it. For instructions, see Section 2.3.7, Uninstalling the Mobility Pack. If you do not uninstall the Mobility Pack correctly, you cannot install the next version. The Mobility Pack Installation program should start the Synchronizer services for you. Open a terminal window, then log in as root. If the installation proceeded normally, the four Synchronizer services should be running. The Synchronizer services can also be managed independently, as described in Synchronizer Services in the Novell Data Synchronizer System Administration Guide. The Mobility Pack Installation program starts the GroupWise Connector and the Mobility Connector for you. Use Synchronizer Web Admin to check connector status. Replace data_synchronizer_server with the IP address or DNS hostname of the server where you installed the Mobility Pack. Log in as the Synchronizer administrator that you set up during installation. If the installation proceeded normally, the GroupWise Connector and the Mobility Connector should be running. Start the GroupWise Connector first. Start the Mobility Connector second. See also Working with Synchronizer Log Files in Synchronizer System Management in the Novell Data Synchronizer System Administration Guide. Click the GroupWise Connector, then click Users. Verify that all users have been successfully added. Click Home to return to the main Synchronizer Web Admin page. Click the Mobility Connector, then click Users. (Conditional) If any users were not successfully added during installation, you can add them manually afterwards and then verify that they have been added. IMPORTANT:If users’ LDAP user names are not the same as their GroupWise user IDs, you must update their application names in Synchronizer Web Admin before initial device synchronization can succeed. For instructions, see Changing a User’s Application Name (Mobility Pack Only) in Connector and User Management in the Novell Data Synchronizer System Administration Guide. You can change this personal address book selection setting for users after installation in Synchronizer Web Admin, as described in Customizing a User’s Synchronization Settings in Connector and User Management in the Novell Data Synchronizer System Administration Guide. Users can also change their own synchronization settings on the User Options page in Synchronizer Web Admin. The GroupWise Address Book cannot be synchronized to mobile devices. However, users can still access individual contacts in the GroupWise Address Book, if their mobile devices can do a Global Address List (GAL) lookup. As an alternative, users can create a personal address book that is a subset of the GroupWise Address Book to synchronize to their mobile devices. If shared calendars are important to users, shared calendar owners can post them to the Internet using the GroupWise Calendar Publishing Host, as described in Publishing Personal Calendars on the Internet in Calendar in the GroupWise 2012 Windows Client User Guide. After the owner publishes the calendar, other users can view the calendar URL in the Web browser on their mobile devices. For Calendar Publishing Host setup instructions, see Installing the GroupWise Calendar Publishing Host in the GroupWise 2012 Installation Guide. Email messages in the Mailbox folder for the last three days. If users want to receive more existing email messages on their devices, they can their mobile devices to request additional existing email messages. Folders in the Cabinet (but not items in folders until users request them by opening folders on their mobile devices). In Synchronizer Web Admin, you can monitor the progress of data synchronization from GroupWise to the Mobility Connector, as described in Monitoring Mobility Connector Synchronization Status in Synchronization Monitoring and Management in the Mobility Connector Installation and Configuration Guide. IMPORTANT:If you selected Block Incoming Devices during Mobility Pack installation, you must unblock incoming devices in Synchronizer Web Admin after all GroupWise data has synchronized to the Mobility Connector. Follow the instructions in Blocking/Unblocking Incoming Devices before Initial Synchronization in Mobility Connector Configuration in the Mobility Connector Installation and Configuration Guide. Users must configure their mobile devices to connect to the Synchronizer system, as described in the Novell Data Synchronizer Connector for Mobility Quick Start. For device-specific information, see the Data Synchronizer Mobility Connector Devices Wiki. IMPORTANT:These two sources of information can help eliminate the need for mobile device users to contact you with functional and device-specific questions as they start synchronizing GroupWise data to their mobile devices. Reply to the message from your mobile device. If the message synchronizes to your mobile device and the reply on your mobile device synchronizes back to GroupWise, your basic Synchronizer system is up and running. To customize and expand your Synchronizer system, see Section 2.5, What’s Next. IMPORTANT:When you uninstall the Mobility Pack software, certificate files are also deleted. If you have obtained commercially signed certificates for use in your Synchronizer system, back them up before uninstall the Mobility Pack software. In a terminal window on the Synchronizer server, become root by entering su - and the root password. Remove the Mobility Pack repository from the Linux server. IMPORTANT:If you do not remove the existing Mobility Pack repository, you cannot successfully install the next version of the Mobility Pack software. In YaST, click Software > Software Repositories. Select the Mobility Pack repository, then click Delete.